LeRoy Grams was from Campbell County Wyoming. He grew up and lived on a farm outside of Gillette, Wyoming. He was drafted into the Army Air Force in October 1944 and discharge December 1946. He was an expert in M1 Rifle and 45 Caliber Pistol in basic training. 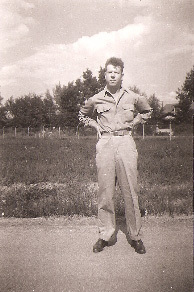 He was a clerk typist at Lowry Field Colorado. He earned the Victory Medal, Good Conduct Medal, and The American Theater Service Medal.